Looking for the best Ryobi batteries should be on the mind of every Ryobi power tool owner. Ryobi was one of the first manufacturers to integrate it’s battery system into it’s power tool range. The general idea is to ensure any Ryobi power tool will be compatible with any Ryobi battery. 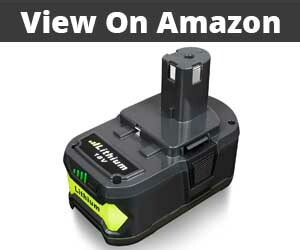 Because of this professionals and DIYers alike will soon realise they are in need of more Ryobi Batteries, as using one battery for multiple tools or waiting for your battery to charge up can add time on to any job. All batteries belonging to the Ryobi ONE+ range run on 18v, and all of these batteries (even if they are Lithium-ion or NiCd) will work in any of the 50+ Ryobi power tools. Today we will be looking in depth at the best Ryobi batteries! High Capacity – Allowing users to get lots of use from their battery before needing to recharge. Low Cost – Batteries are a consumable item which need to be replaced over time, this can get expensive. Size/Weight – Carrying around 10kg+ of batteries is going to get tiring. When we have found a battery that meets all this criteria, then we will know we have found the best! Most tools today are powered by Lithium-ion batteries, they offer a superior power to size/weight ratio, have a higher current draw and also hold their charge 4 times better over time compared to NiCd batteries. However, be aware that if you are working in cold conditions NiCd might be the way to go as they can be charged below freezing and Lithium-ion batteries cannot. Lithium-ion batteries also are typically more expensive. All batteries shown in this review are compatible with the Ryobi One+ System. They will work on the entire Ryobi tool range. The Ryobi RB18L25 ONE+ battery is an official battery released by Ryobi, meaning you are going to get perfect functionality and compatibility with all of the Ryobi tool range. The battery is 18v so you can expect lots of power from this battery but what let’s it down is it’s capacity. At just 2.5Ah this battery is more suited to occasional users and light use, if you are using tools which require extensive periods of use (like the Ryobi Lawn Mower) I would personally look at a higher capacity battery. Advice For Buyers: This is one of the official Ryobi brand batteries. For what you get it’s rather expensive, if you want better value please keep reading. However, if you are an occasional DIYer or you are looking a battery for light work, this could be ideal. It’s biggest disadvantage could be just what you are looking for, due to it’s small capacity it comes in a small sized package. This is ideal for people looking for light weight tools which is perfect for those who work at heights or people who work on the move. Just as with the Ryobi Lithium+ 2.5Ah ONE+ above, this is an official product from Ryobi and it’s their top of the line battery. You are going to be getting a huge capacity battery, that is completely compatible with all of the Ryobi range. Due to the way Lithium batteries deliver power you can expect a huge cranking ability and high torque delivered from this product making it ideal for the entire Ryobi range including high intensity power tools such as this chainsaw. Thanks to the huge 5amp/hours battery life you can expect this battery to give you a huge amount of use. The battery case is also excellent, nice and strong and should take a beating should it occur. Out of all the products tested in this review, we found this one to be the best. But at twice the price of aftermarket alternatives listed below, it should be. Unlike the other two Ryobi batteries mentioned above, this is not part of the Lithium+ range but really that’s not a problem. This is a super light battery with a very small capacity making it ideal for Ryobi products like the torch, blower, Ryobi Weed Eater or vacuum cleaner. This is not the battery for you if you are going to be using power tools that require a bit of grunt, you really will not get much use out of them. However, they are ideal for lighter use products. Because this is not part of the Lithium+ range, you can’t expect this to charge as fast or last as long as the other two products. 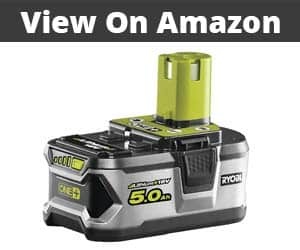 Also, while this is the cheapest Ryobi battery on review today our next product shows you where you can get a 5Ah battery for just a little bit more money. This is the best value product on review today. The Creabeast 5Ah battery offers around 80% of the performance, for about half the cost of the Ryobi Lithium+ 5Ah. This battery offers excellent performance for a lot less money. It’s able to do this because it’s an aftermarket battery and not an official Ryobi product but don’t let this trouble you, this battery is made using LG manufactured battery cells. These are some of the best you can get and ultimately this is what you are buying. Other brands of aftermarket batteries are made in all manner of places but with this product we know exactly what it is we are getting. This product offers all the things we are looking for, for very little money. 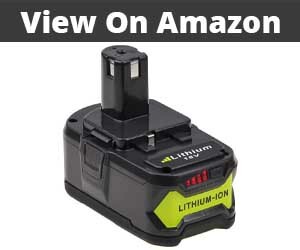 This particular brand is also well known for producing batteries for tradespeople, offering products through outlets such as Amazon at a low cost for professionals. While the design is plain the body is well constructed and this battery could take everyday wear with no issues. This battery also features a LED battery level indicator letting you know exactly how much life is remaining before needing another charge. Creabest also offer this battery in a 3Ah size for an even lower cost for those looking for a smaller capacity battery, available here. 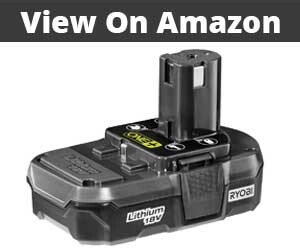 The FLAGPOWER 4.0Ah Ryobi Battery offers something even the Ryobi range of official batteries does not… it’s 4.0Ah form factor offers a great balance between size/weight and capacity. This is not a size of battery which is available in the current generation of Ryobi ONE+ batteries. The FLAGPOWER brand is a well known seller of many aftermarket batteries and reviews seem strong. In our tests we were happy with how it performance and this would be a close second place behind our recommended product. This particular battery also features a LED battery indicator, enabling you to monitor battery life as you use the product. The Eagglew Lithium One+ aftermarket battery offers 5Ah of life in a great low cost and stylish package. 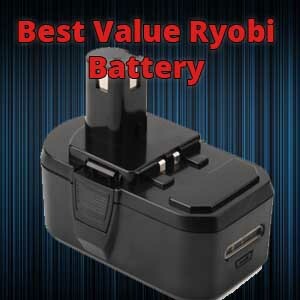 Compared to other brands the visual style of this battery sort of resembles the official Ryobi battery which means it will match the green colour scheme of the Ryobi Tools. Being 5.0Ah you will be able to run all of your favourite tools from this unit with no issues and long life thanks to it’s huge capacity. This battery also features a LED indicator allowing users to monitor battery charge while on the job, a very handy feature. 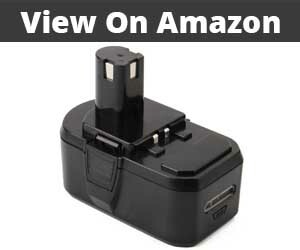 This particular brand of product offers their battery with a slight discount for ordering 2 batteries. This can be a great idea if you are looking to stock up or require a number of batteries. This offer can be found here. Battery technology has come a long way in the last 10 years, thanks to devices such as mobile phones and other devices like these the demand for small, powerful batteries has sky rocketed. Typically most modern batteries are based on Lithium polymers but there are also many other types of battery such as Alkali, NiCd, Calcium or Gel. All of these types of batteries have their positive and negatives, here we will be focusing on Lithium based batteries as all the batteries in this article are Lithium based. High capacity to size ratio, allowing small batteries to hold high amounts of power. High discharge rate, meaning they release huge bursts of power when required compared to other battery types. They can start fires, never charge or use a puffy or damaged battery. Lithium batteries can be sensitive to temperature, charging them below freezing can cause damage. Aging, unlike some other types of batteries the capacity they hold dwindles over time and eventually they will need replacing. Taking proper care of your Ryobi batteries is important. This can extend their life and make sure they always perform their best when required. 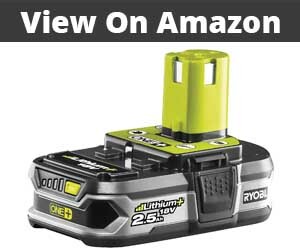 There are two main types of Ryobi ONE+ batteries, they are the Lithium and Lithium+. The easiest way to think of these is two “grades” of battery. Both types of battery are made using Lithium but in this case the Lithium+ will perform better, allowing more energy to be absorbed by the material. The performance difference between the two though is minimal and it’s fair to say it’s a bit of a gimmick… Yes, if you absolutely want the best possible performance from your tools go with the Ryobi Lithium+ but most of the time using tools is not a race. The advantage you are going to get in average DIY or even professional use will be minimal, in my eyes it’s not worth the added expense. The best Ryobi battery we found was without doubt the official Ryobi 5.0Ah ONE+. However in this occasion this is not the one I am going to recommend to you. Due to it’s high price and minimal performance boost over the Creabest 5.0Ah ONE+ I would recommend you spend about half as much and get something 90% as good. The Creabest 5.0Ah ONE+ offers fantastic capacity, battery cells made by a household brand in LG and a great battery body that will be able to take the rough and tumble that power tools go through everyday. In case you feel that we left out some other options let me know. I will be happy to add options to this review in the future! Will these batteries work with the Ryobi Intelliport charger? Yes! All the batteries listed above will work with this charger. You do not need to buy a new charger for any of these batteries, they are completely compatible with the Ryobi system. I have Ryobi One+ tools with the old NiCd batteries, will these fit my tools? Yes! All these batteries are 100% compatible with the One+ system. Can these ryobi batteries replace a bpl-1815(134029010) 18v lithium battery? Yes, these batteries are ideal replacements for the older Ryobi batteries. Do these batteries fit Yyobi models chd1441/chi11442p ? No, these are 14v batteries. These are not part of the Ryobi One+ system. 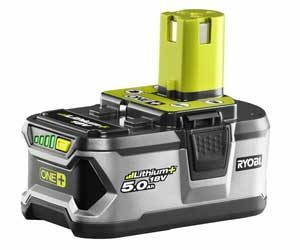 Will Ryobi batteries fit other brands? No, it’s very unlikely that these or any other Ryobi batteries will be cross compatible with other brands of tools. Max is a 31 year old blogger from Worcester, UK. He has a masters in Computer Science and is currently running a marketing agency based in London. In his spare time he likes to review technology and out doors equipment. Read more about him. Can these batteries be charged using the standard Ryobi 1+ charger bundled with their Drill kits? Yes! These are all compatible with the standard Ryobi One+ chargers. You need to be careful. A lot of 5Ah third party batteries are actually 4.1Ah. Nobody is regulating the claims of Chinese third party batteries. I would never buy a 5Ah aftermarket battery – most are 4Ah. There are some sellers who don’t lie about it. And by the way, all the 3rd party “lighted indicator” batteries are identical. I have Ryobi tools that use their 24 volt battery. I can’t find anyplace to buy these batteries. What is up with these batteries? Flagpower 5ah batteries from Amazon have become my favourite Replacement batteries, they are cheapish look good and more importantly last ages in use, I now have 3 of them to take over from my weak 1.3 and 1.5 Ryobi batteries. I have a Creabest 18v 5.0AH Ryobi pack. It powers my 1/2” impact very well and has never cut out under power. I do keep it between 30-80% charge as I have other packs I can use if needed. But even rarely getting a full charge it will remove and install lug nuts all day. For the price and the power I would recommend, however…. My good discharge machine is down for repairs at the moment so my only test is with a max of 25 Watts. This translates to a roughly 1-1.5A discharge. At this rate I get about 3800 Mah to a 15V minimum. We are a participant in the Amazon Services LLC Associates Program, an affiliate advertising program designed to provide a means for website owners to earn fees by linking to Amazon.com and affiliated sites, as well as to other websites that may be affiliated with Amazon Service LLC Associates Program. COPYRIGHT © 2019 - FINDME10.COM, ALL RIGHTS RESERVED.